The L'Oréal Professionnel Serie Expert Vitamino Color Shampoo and Masque Duo combines two professional formulas to restore radiance and shine to all hair colours. Suitable for colour-treated hair, the shampoo gently removes impurities whilst adding luminous shine for a vibrant and healthy-looking finish, without extra weight. Specially formulated with the brand's A:OX technology to deliver a high sheen finish, and enriched with Panthenol to maintain moisture levels. 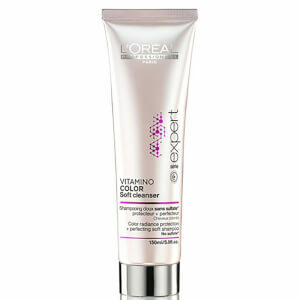 A luxurious treatment that helps to protect and strengthen hair against everyday wear and tear. Targeting weak and damaged areas of coloured hair, the innovative, Panthenol-enriched formula creates a lightweight film that intensely nourishes and enhances shine to leave locks vibrant and healthy-looking from root to tip. Máscara: aplique no cabelo enxuto com a toalha e deixe atuar apenas um minuto antes de enxaguar. Use duas vezes por semana.